Manufacturer of a wide range of products which include oxygen purity test equipment and compressed air purity test. 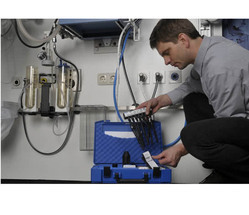 Designed to meet the requirements of medical supply systems, the Dräger MultiTest med. Int. checks the purity of medical gases. A single test system is all that is needed to detect contaminants in compressed air, nitrous oxide, carbon dioxide and oxygen. The test system determines the concentrations of water vapor, carbon monoxide, carbon dioxide, hydrogen sulfide, nitrous gases, oil and other contaminants in the compressed air flow. Testing as per ISO 8573 Standard. The use of the Dräger MultiTest med. Int. enables the reliable verification of medical gases, according to the quality criteria of different standards, such as United States Pharmacopeia (USP) and European Pharmacopeia.